AEGIS-E series is a portable jammer in a rugged case on wheels and has been strictly designed for EOD team. 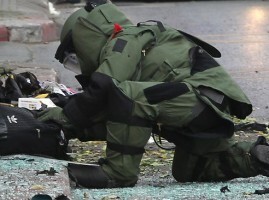 A terrorist or insurgent at a remote distance may watch an EOD personnel approaching and trying to disarm the bomb suspect and then detonate it by remote control to kill the personnel. AEGIS-E series is needed there to prevent the bomb explosion and protect the EOD personnel’s life. AEGIS-E series works to disrupt wide frequency bandwidth at 20~2500MHz to deflect RCIED. It’s available to extend to maximum 6GHz. Total output is greater than AEGIS-M (Backpack Jammer) but less than AEGIS-V (Vehicle-mounted Jammer) and about 300~350W. AEGIS-E series, built in a rugged hard case of Pelican or Storm, is on wheels for maximum mobility. Battery is already built in but removable for the ease of movement. Dual use is available of both batteries and AC power supply.